Love Blackberries? Why Not Grow Your Own! Did this weekend’s Blackberry Festival reinvigorate your hunger for tasty, juicy blackberries? 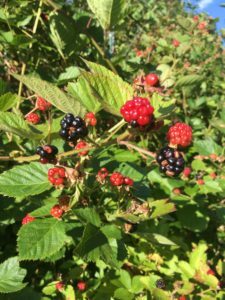 While we do not have many large-scale blackberry farmers in Caldwell County, many people have their own blackberry patch, and you can, too! Blackberries fare well in our climate and only have minor concerns with insects and diseases. If you have ever harvested wild blackberries, you know that many have thorns, and scrambling through brush for each precious berry is a formidable task. Fortunately, there are improved blackberry cultivars that are thornless in case scratching up your shins does not appeal. Planting your own patch also provides the opportunity for trellising the canes, pruning, and managing the size of the plot. Botanically, blackberries are not a true berry. Rather, the fruit is composed of drupelets. A drupe is a fruit that has sweet flesh surrounding a seed. Each segment on the blackberry fruit is a drupelet with its own seed. Blackberries are a delicious and easy-to-grow addition to the homestead or home garden. Blackberries are considered caneberries because the plant does not have one central stem or trunk, but rather sends individual canes up from the ground that bear leaves, flowers, and fruit. Raspberries and blueberries are also caneberries, and raspberry fruit is also composed of drupelets. Each cane lives for two years. Canes are called primocanes in the first year and floricanes in the second year. Most varieties have canes that bear fruit in the second year, and so they are called “Floricane” varieties. However, the University of Arkansas has developed a line of “Primocane” varieties that bear fruit on first-year canes. These have “Prime-Ark” in the cultivar name. Blackberry can be erect, semi-erect, or trailing. The more upright “erect” varieties form a good hedge and often ripen earlier than do some of the semi-erect types. Many are thornless and produce large, juicy berries, but have slightly lower yields than the trailing types. Examples include Navaho, Arapaho, Natchez, and Ouachita. They do not require trellising if the new canes are pruned during summer so that they remain 3’-4’ tall. Popular semi-erect blackberries are Triple Crown, Hull, and Chester. These are easiest to manage and harvest when trellised. For a family of 4, plant 2 trailing plants or 6 erect plants for a good supply. It’s best to establish blackberries in spring, but site preparation can begin in the fall ahead of planting. Blackberries do best in a well-drained site that gets full sun, has good air movement, and can be irrigated when necessary. Plan your trellis system if needed. Ideal soil pH is 6.0-6.5. Take a soil sample in the fall and correct the pH and soil nutrients as recommended by the test results. Plan also to remove wild blackberries within 600’ of your planting site. The wild types carry a disease called Double Blossom, which infects certain cultivars. Blackberries should be pruned during the winter to remove dead canes and long canes can be cut back to fit the trellis. Primocanes should be tipped during the summer to encourage branching and fruit production in the floricane year. Instead of cutting the tips back in summer, break them with your hand, as this promotes faster healing. This can help reduce the likelihood of infection from a fungal disease, cane blight. White druplet often occurs with and abrupt increase in temperature and decrease in humidity, often accompanied by windy conditions during fruit development. The change in humidity and temperature allows more ultraviolet light to reach and damage the fruit. extreme heat or windy conditions. The spotted winged drosophila (SWD), a fruit fly, can also lay eggs in fruit without damaging the fruit skin. To reduce populations of SWD, remove all ripe berries at each harvest and pick up fallen berries from the ground. Traps can be used to monitor SWD populations, and some insecticides can be effective but are not typically needed for a household blackberry patch. Once harvested, place berries immediately in cold storage. They can be refrigerated or frozen for later use, and of course used in pies, cobbles, jam, and much more! 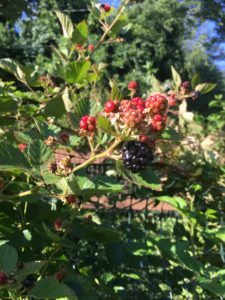 We will be selling several regionally-appropriate blackberries as well as other fruits to plant at our annual Edible Plant Sale in March at the N.C. Cooperative Extension, Caldwell County Center. Soil test kits are available for pick-up anytime at the Extension Center, located at 120 Hospital Ave NE, Lenoir, NC 28645. With more questions about growing blackberries, gardening, or soil sampling, contact the Extension Center at 828-757-1290, anytime Monday-Friday 8:00 a.m. – 5:00 p.m.